Can I just start by saying, this personalised cards website is fantastic!! I know there are others, but the flexibility and control that Yoodoo give you is second to none! 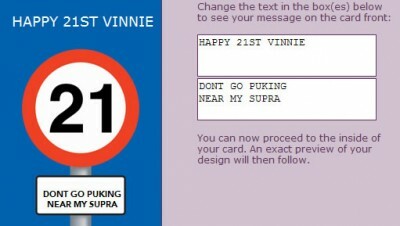 Check out the screenshot of the custom made 21st birthday card I made for my good friend Vinnie! An glossy A4 copy with a personalised front, and inside cost me less than a fiver! You pay more than that in some high street card shops! Give Yoodoo a visit and make that 21st birthday card that little bit extra special! Do people still search for 21st birthday ideas? What it means to turn 21 around the world. How to Avoid Having the 21st Birthday from Hell!